You may remember my trip to the cocoa plantations in Tanzania a year or so ago, well, my other half, Mr Chocolate was sourcing cocoa beans at the time. It was an eye-opening experience seeing cocoa trees for the first time (bizarre considering how chocolate is such a normal part of our lives – almost like drinking milk daily but never having seen a cow) but what really struck me was how much the cocoa farmers are exploited by huge companies. When one of the farmers asked me what we do with the cocoa beans, I was floored; in the remote area they grow cocoa in, you cannot buy a single chocolate bar – it’s too expensive for the 1 dollar (R13) these farmers live off each day. Mr Chocolate was equally disturbed by the fact that as chocolate-lovers, it comes at a premium price for us when these farmers clearly aren’t being paid what they deserve – this is because all the middlemen add their own profits along the way, for essentially doing nothing. 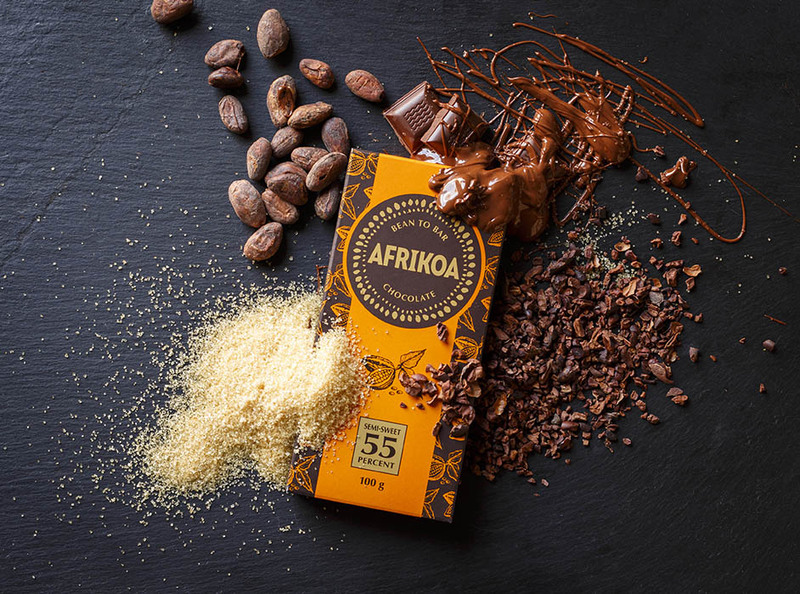 This is how AFRIKOA and South Africa’s first direct-trade bean-to-bar chocolate was born; with the simple idea of a chocolate-maker buying cocoa beans straight from the cocoa farmer. This way, the farmers get 250% more for their cocoa beans than they normally would, Mr Chocolate gets fresh cocoa beans that haven’t been sitting in a warehouse for months on end and we get to enjoy chocolate knowing that our pleasure doesn’t come at the expense of anyone else. It’s a win-win. 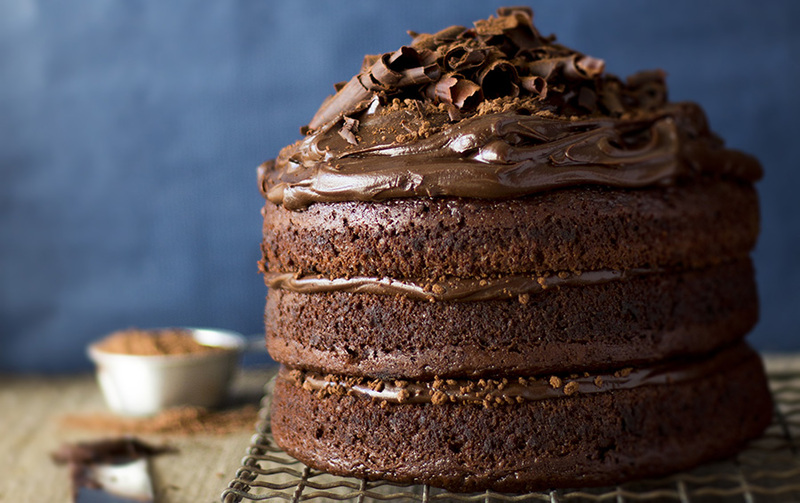 While there are 4 different types of AFRIKOA chocolate; a 27% milk, 70% dark and an 80% sugar free, I’ve used the 55% semi sweet dark chocolate in my favourite chocolate cake recipe. 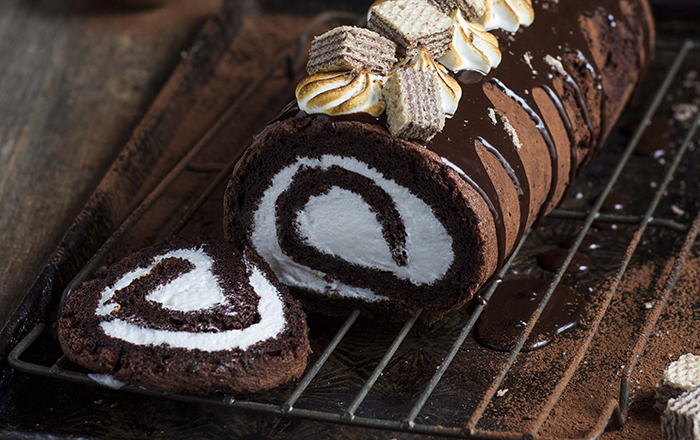 It’s fruity got loads of toasted hazelnut flavours and really easy to bake with. 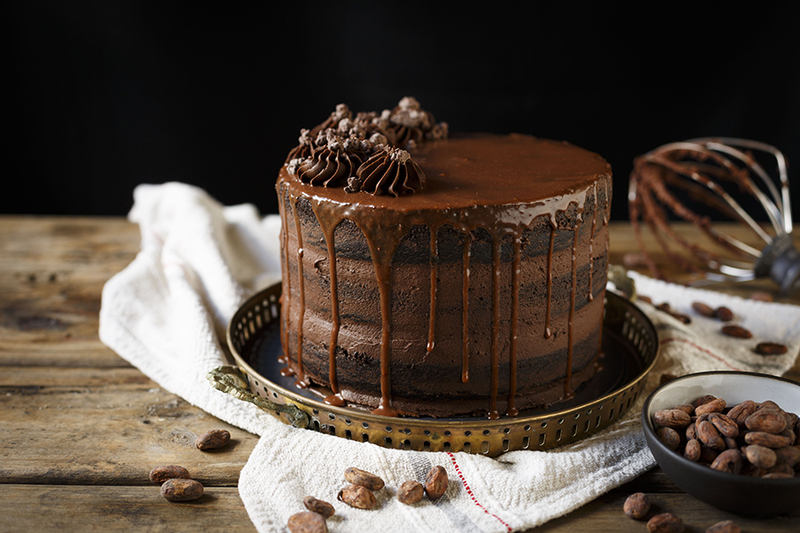 This cake is definitely not short on chocolate; it has it in the sponge, buttercream and drip! 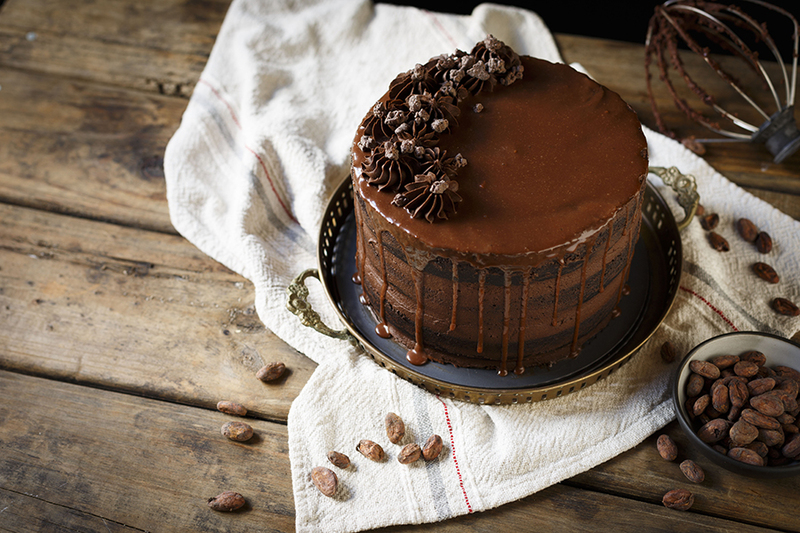 And the cocoa nib crunch adds an amazing textural surprise – a real showstopper! Preheat oven to 160C (fan-forced). Grease and line 3 x 24cm spring form cake tins. Boil water then add oil and sugar. Stir until the sugar is dissolved and then pour over the chopped chocolate. Stir until smooth. Whisk eggs lightly then stir in the chocolate mixture. Fold in the combined dry ingredients. Let mix stand covered for 1 hour. 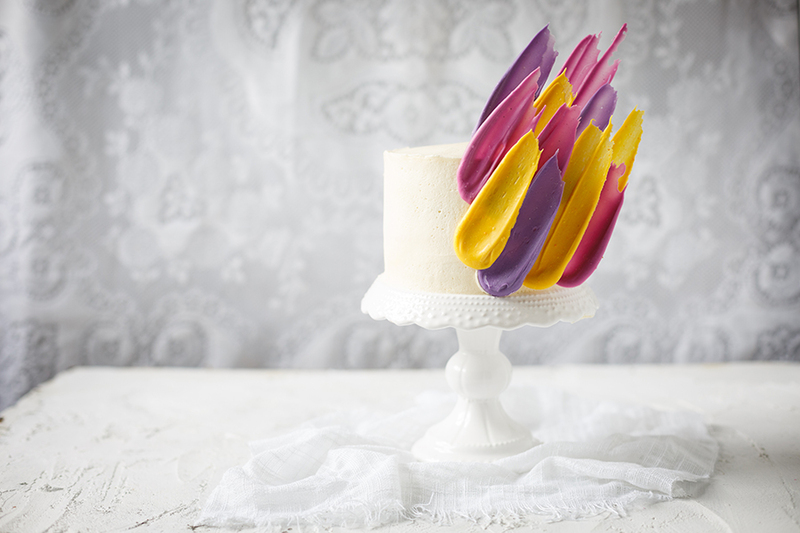 Place the batter into the lined cake tins and bake for 25 minutes or until a skewer inserted comes out clean. Allow to cool for 5 minutes before turning out. Cool completely then level the tops with a sharp bread knife. For the buttercream, combine the egg whites and sugar in the bowl of a stand mixer set over a pot of gently simmering water and cook, whisking constantly, until the mixture it hot to the touch or is no longer gritty when rubbed between your fingers. Transfer to the stand mixer and whip until glossy, stiff peaks form, about 5-7 minutes. Add the butter a few pieces at a time and whip until the frosting is creamy and smooth. 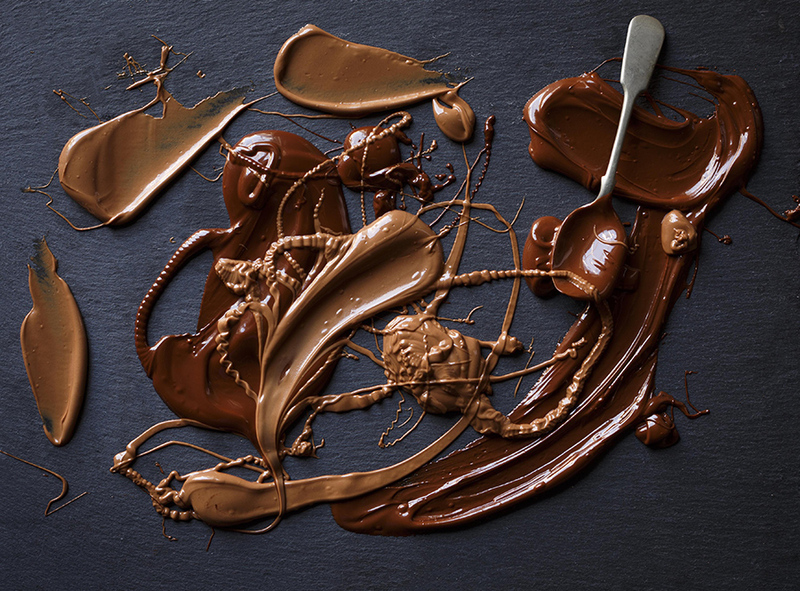 Fold in the melted chocolate. Make the glaze by combining all the ingredients in a bowl, microwave until the chocolate is melted and the glaze is smooth. Cool to room temperature. 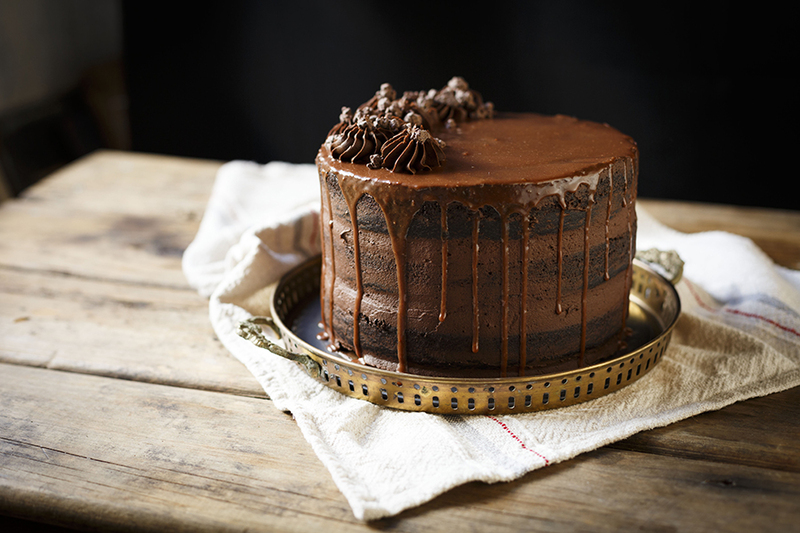 To assemble the cake, layer the sponges alternately with whipped ganache, leaving enough to cover the top and sides. Spread the glaze over using a palette knife to make sure it drips down the sides. Pipe a few rosettes on top using any leftover ganache and sprinkle with crunchy cocoa bits*. TIP To make the crunchy cocoa bits, place 100g sugar in a saucepan with 2 tbsp water and heat until caramelized and golden. Add 1 cup of cocoa nibs and 1 tsp of sugar and stir vigorously until the caramel starts to crystallize. 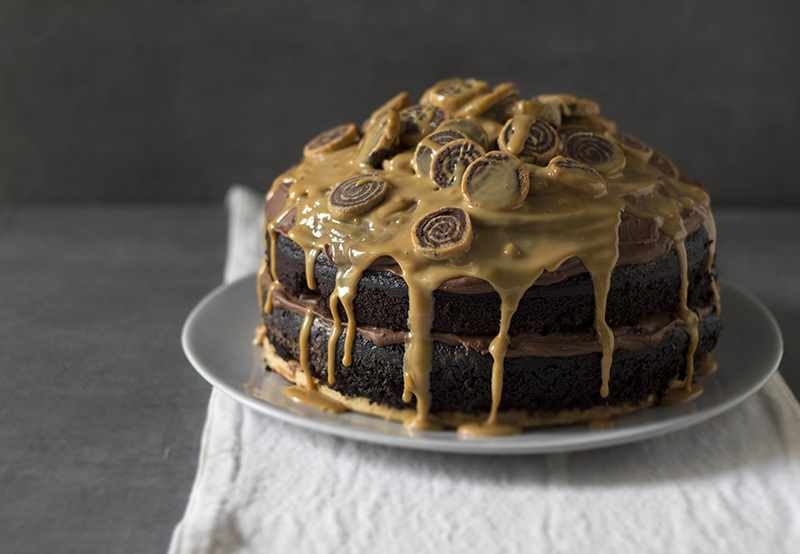 Pour onto a baking tray and allow to cool. Melt 25g AFRIKOA 55% Semi Sweet Dark chocolate and then toss the caramelized cocoa nibs in the chocolate. Spread them out again and allow to set. Hi I’m in Durban where can the chocolate be purchased ?